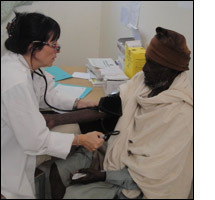 Over the past 16 years I have had the opportunity to participate in several medical missions. Each mission has touched me in a very special way; sometimes it has been the people we helped, or the in-country people we worked with, or sometimes the experiences of each team member. This mission touched me in a different way. While I have seen very poor hospitals on my missions, I have not seen the level of daily challenges that this hospital faces each day. In the Operating room for instance there is no oxygen; in fact, there is no Oxygen available at all in the entire country. Surgeries are performed with compressed air; there are no cardiac or respiratory monitors either. The hospital laundry is done manually by a group of older women using buckets, long brushes and wood boiled soap. Drying is done outside with the sun. During the rainy season, the laundry becomes an unimaginable challenge. It became very clear to us how the staff of the hospital while not having appropriate resources, are very resilient, proud and are able to provide the best care they possibly can with what little they have. I was truly impressed by the hospital director, he has a vision, and he wants to help his community by making the hospital the best it can be. I am very grateful for the opportunity to participate on this mission. We worked with great people, made special bonds and hope to be able to go back next year to continue helping them improve their health care.